Green laser P= 240 amplitude. still laser2. Issue to restart: on the PC GUI, current was well 35A but not on laser side -> so no pulse on lightchecker. dismount Quatronix Blue 1. room free from HCAL. Green laser: the laser power (controler) is dead. the laser Head is fine. replace anyway all with new one : new controler and new head. Retune the coupling. still no ligth on 20June when run restart: problem of too low power. Set as 255 (max P) and pulse is back on light checker. P=255 -> to high power. Green laser problem, sequence red on light Checker. DP2-1: water flow error !. 2.3L/min. Clean pipes, flush all. replace long pipes with shorter one. no effect. replaced the pipe with flow sensor. Back to 2.8l/min . stable. DP2-2 still online for begining of physics. test green laser. replace old chiller DP2-2. Long test fibre : cannot find the pulse on matacq/DQM. posponed to ..unforeseen date. the delay on dBGUI LM region seems too high: not possible to put huge value. 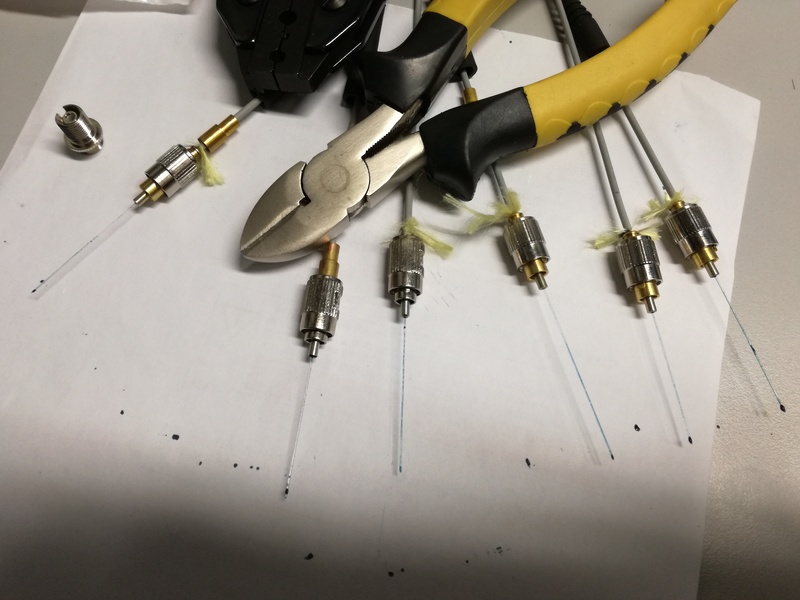 long fibre test posponed : no connectors on one end of the bundle ! received new chiller for DP2-2. Liyuan's visit. Summary here. New chiller ordered. the black on on DP2-2: still leaky. The spare one is the old one which need the separate heater device. Water flow error DP2-2. Swap with DP2-1 , 15h40. problem : connection of the batterie and pin diode Matacq! soldering again. need better fixation . General power cut on 9 March: only lasers went OFF, not control room. Green laser restart with internal trigger by default. restart lasers: maintenance DP2-1 : flush cooling pipes because of low flow rate bellow the limit (2.6 l/mn). now it is 3.2l/mn. Green: put back external mode. PC: ecal-laser-room-02: connection is bailleux@cmsusrpup only , not .cern.ch ! reconfigured GPIB ok . Problem because no more .dat file on slow monitoring --> on ecal-laser-room-02: #printenv there is no DIM_DNS_NODE ecal-laser-room-05 running ! --> start again ./run on dp2n, ok ! saturday . bad DQM data: laser too hig on EB, too low on EE.. elog. eems wrong attenuation. Go to Pt5 to perfom a hard reset of the SHOT102. tehre was no error on log file, attenuation well moving from software but was wrong information: no way to be detected other then d<ata quality on DQM. (remote attenuation is after the matacq or fast monitor so cannot be seen). A suspect faulty SHOT102 after touching the DG535 which is on the same loop. new DG535 for DP2-2 : no more jitter, back to delay A=12.560us. --> bad DG535 box as in Feb2015. error flow again on DP2-1 : clean - flush the pipes and flow back to 3.0 - 3.1L/min. Was down to 2.8 before. start green NRJ scan . elog here. low flow error on laser: fake alarm! all ok when turn OFF and ON. B field was finished to ramp up at around 6pm. laser error at 8.30pm. Change to DP2-2, spare one from Friday 11pm : 35A and 35% internal attenuation. restart lasers, PC. and LMFC on ecalod machine. Stop laser data taking, magnet ramp down. all OFF as (PCs off) because of 400KV intervention. lasers DP2-1 was 35A and 30% internal attenuation. Liyuan visit. Quick check of DP2-2, only calibration. No other things because of data taking. Low flow error from chiller spare DP2 , DP2-2. 16 august after vacation: a water pipe leaks.. under the thermal foam. Cannot open fully the chiller , need to cut the pipe and add extension.
. put CAEN PCI board on it : from first PC, or from Evgueni or from sysadmin.
. reboot vme crate - clean fibre if not working. no conclusion why at the end. following that try to see how to change with the spare PC : vme-pc-laser-room-01 to 02.
first attempt : not so easy and no time because of beam... borrow the CAEN PCI from M.Dobson. changing Alias of the PC take time. need to validate the USB green laser as well. plug a new USB sensor key on vmepc-ecal-laser-01. 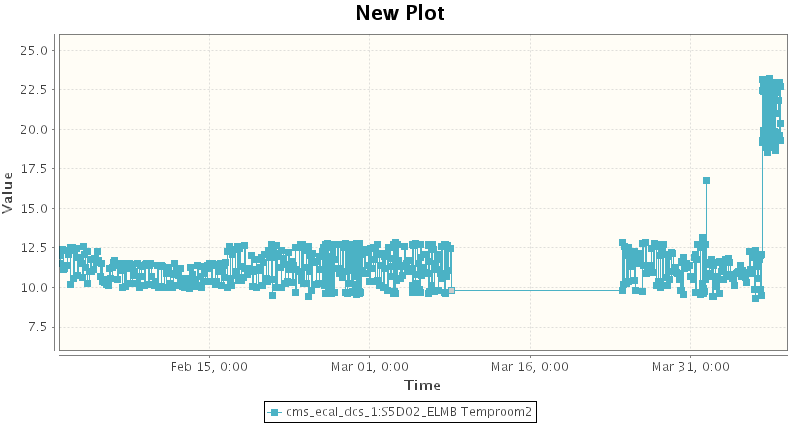 temp plot on lightchecker for Marc. - average value no more OK . 12deg for the 4 probes. - the one display on the DCS in blue and green are data from our laser DAQ, not from ELMB. choose ECAL, ECAL laser room temp. Dp2-1 power a bit lower than before while should be higher : best coupling and main fibre polished. pin diode to be retuned. same calibration as in Feb.
1) The output power of the two DP2-447 lasers is measured as function of the current of pump diodes, no evident degradation is observed. The 1st DP2-447, which has been online since last year�s maintenance, now has a total runtime of 15K hrs (about 2 times of the warranty time), indicating that running the laser at 35 A pump current (with a maximum of 50 A) increases the lift time of the pump diodes. The pulse energy, width and jitter are evaluated with internal trigger and a short term run of 1~2 hrs, they are all well within the specification. 2) The ancillary optics of the two DP2-447 lasers are checked and the total transmittance is measured, no damage and degradation are observed. The output fiber of the 1st DP2-447 laser is polished and cleaned, and the coupling alignment is optimized. While the power measured after the 1x100 optical switch is increased by about 10%, the monitoring pulse amplitude at the fast monitor and LightChecker doesn�t linearly increase, which may be caused by mismatch of the area of PIN diode with the beam size or misalignment of the beam on the PIN diode in the monitor box. More diagnostic is needed to figure it out. If it�s true, we may insert a beam matching lens in front of the PIN diode to improve this power monitoring linearity in near future. 3) The Quantronix Ti:S IR laser is also checked and tested, it�s basically in working condition, but long term stability may be a concern. If it�s needed, a DPSS Ti:S laser with affordable cost would be an upgrade option. 16Feb: lasers online, green and Dp2-1 : 35A, 30% internal attenuation. calibrateur Vinj and yoko7555 : try to connect back on PC to get the status online. Technical stop , no laser but found the green laser running ! in fact it was in internal trigger mode ! --> changed the connection of the 2 USB ports. In oct, 2-3 hard reset of VME PC . unknown reason. last one : CPU failed on Friday 6Nov. maintenance cooling ventilation laser room. - delay adjust in side laser supervisor file : ~ecalpro/.lasercfg -> "nimdelay = 7887" or 1ECF. it was 7897 originaly. then I found good value 1ECE=7885 but a bit toow low: based time is 12.5ns so 7887-7885 = 2x12.5=25ns. - green_laser_power=5 % on dBGUI instead of 20. for the EE it is : 5x8=40%. this value is reset after each new run so need to fine a solution. Alu piece for the green laser done. after 10m fibre + coupling to the main fibre: 52mW: 6dB. the delay should be the same as the old laser but nothing on Matacq for the 1st attempt. put IR laser on the sequence. install new electronics for spy box. laser data from DIM server ok , PVSS up to date now. finish to put back IR laser. ready for Monday if needed. - calibration were stop during splashes events , do not lost data of physics. - proceed to the EDH order for spare parts and consumable. see technical doc. wait next year for diodes. - test the new PCi expansion box from Gigi. all ok under B field. - green laser should arrive 11 May. - replacement in progress of old spare PC ecal-laser-room-09: should be vmepc-ecal-laser-02. - need probably to put back RED laser. - intermitent power on laser dp2-1 on matacq : shutter error on logfile. restart the soft solved the issue... Matacq plot. - new script to get a logfile automatically: ./run instead or ./laser. - fast acqiris: remove line 247-250 in monitor.c to remove time out text on terminal and see the trigger rate.
. dp2-2 with lower attenuation for Gain 200 since few days.
. problem time to time loosing some events : less than 600 ! so no data on some 1/2 SM..
--> new plot on lightChecker by Marc. to view if all SM got well 600 events. fast acqiris plot 8 March: can see data to 0ADC. need to run logfile to get the time of optical switch.
. add reset SHOT102 ok for Dp2 : test prog. under mydp2 folder. stop run for B field. green laser: shutter is ok but laser problem now. green laser : shutter problem, which explain the on/off on the sequence. after investigation, shutter no more reliable. lost green , shutter block. only dp2-1 ! - plotting green laser on fast : show long queue for the pulse timing and 2 mains peaks... EMTC trigger ? or new Acqiris ? why not red dots on matacq ? - lot of issue with calibration&EG trigger . moved A=12,575us to A =12,545us. water flow error Dp2-1 around 0am. water flow too low at 2.5l/mn. just restarting the chiller and laser : 2.8l/mn , error no more there. Flushing the laser head help: 3.4l/mn. change monitor full scale range during run: 2v -> 0.3V for higher pulse..
after polishing main fibre on 9Fev for both laser, the DP2-2 is going done from 1300 to 500ADC... ?! suspect linear attenuator problem.. because both laser have quite same output level in mW. Check power of DP2s. calibration done after attenuator. check linear attenuator and both ok, 100%=full power. polish main fibre of both laser. DP2-1 should be ok on matacq now. readiness review : one DP2 online is ok now, cf. MArc. - power too low for DP2-1 ? was 1050 ADC before, now it is 450 as for the green. Comme pour l'analyse des fichiers lmf, on utilise la pin connect�e au canal 1 du matacq, je propose d'utiliser la m�me pour le lightchecker. the pin in used for the lightchecker changed from 0 to 1 so lightchecker data may be different ! restart all after 1 week because of no network at CMS. changed the patterz for the spz box. 100% for DP2-2 mean 100% of power. Keep the same config as before, 29% and 35% for DP2-1 and 2.
modification of the safety box ok: shutter interlock for DP2-1&2. swapped fibres 86 and 87.
reparation of the SHOT102. new Capa. should be ok.
laser run with new monitoring boxes installed. EB- and EE only. same attenuation as last year to compare. Installation of the spy boxes + test output with lasers. JLouis&Inna. - one shot102 failed: burnt. no more working. - dg535 of dp2-2 replaced but to be checked again: light ok but no more display. running on new script #dp2n to get 2 DP2 online. update slow DP2-2 histogram + matacq as ref. from the 12Nov with 3.8T. in order do not have DP2 fired and laser data when Quantronix is on the DAQ sequence, while laser is OFF: change IR laser from offline to online ?! DP2-2: 35A, 100% internal attenuation. was 3% before. Ask to reduce power ~25% for the DP2: on Matacq it is 1400ADC so close to the limit ! should be 1000 on the Matacq. Looking myself at the DQM there is saturation for almost all EB so reduction justified. DP2-2: remote attenuation : 9% for EB, 81% EE (internal = 100%) but as well 5% for EB and 81%EE.. changing time to time... ! because QUantronix offline, but with settings from DB Gui of the quantronix: different attenuation ! --> settting of the DP2-2 to not saturate : 35A, 50% internal attenuation. first measurement give almost 0mW on the channel 1.
after a reset of attenuator, attenuation ok: 12 dB on ch1. Can explain the low power on the APD (factor 2)see by Saclay-DQM. - MWGR8: ask to change the Matacq legend ; and to remove IR laser. seems low signal on APD now x2 ?! Run with external trigger (not calibration sequence) DP2-1 and DP2-2. SHG temp is stable at 0.0deg as it should be ! solved ! DP2-1 water consumption: Found wrong orientation for the filter: the arrow si in opposite direction of the water flow. Inverse the pipe. DP2-1 Fault temp solved. open laser cover and touched LV connector. DP2-1: laser Fault after 3-5min each start : " SHG temp error". 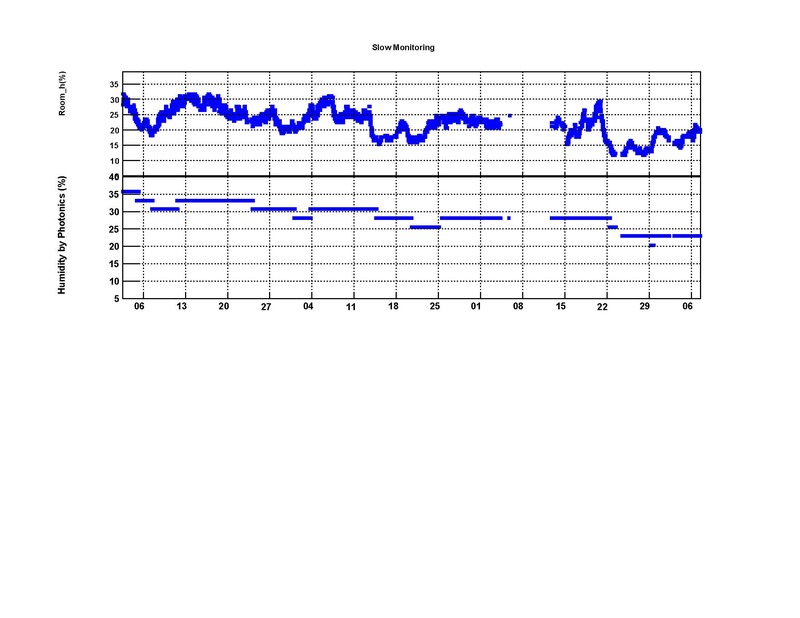 Temp are unstable +-2.5deg while it was +-0.0deg at begining. clean water tank , filter. some dust anormal. --> put PC05 on the rack with Acqiris, all is Fine ! found on ATX connector the +12 V is there but connector is faulty time to time thus only 5V and no 12V on Acqiris. Acqiris is OK: pc05_monitor# ./monitor 99150 pulse is there ! End of WGR5 this evening but no laser data. IR laser: After investigation, found the logic Unit to be faulty. replace the one from TiS1 and current is OK. Calibration done OK.
Fast monitoring ok on PC05 but trigger was ok before and no NOT ! also problem on PC: power12V not here? no graphic mode,ect. ! problem with power supply on PC02: no power from the power cable: fast Acqiris not power on. PC05: Jira ticket: no more graphic mode..
IR laser: try to tune it, doing service after MWG4. Found that current is no more good: always YLF=1080mW whatever the current is: 7A or 20A ! Last Matacq plot: DP2-2, IR, green. Error on display: there is only one blue , IR=DP2-2, Blue= TiS-blue but it is not online , should be removed. in April: Dp2-2 amplitude was 600 @40A 50%, now it's 1000@ 35A/3% !! - histograms online of DP2s lasers. - Power too high. may result of the cleanning campain of all optical connectors. -> change attenuation from 50% to 20% for DP2. then Changed again to 3%. -> changed current from 40 to 35A because of no effect of attenuator bellow 5%. - Nuno Dos Santos for adding a power bar 220V. - EDH to ship quantronix laser2 + parts. - internal run DP2-1, dso21375-1.ps still the unstability of THG SHG. no good ps file and error when DAQ stopped but .ps are OK when processing the .dat file. - DP2-1: no water consumption after 5 days with 0A. Try again with 40A.. no difference after 1 day. wait and see..
- new laser supervisor PC for ecalod-laser-xdaq: pc name is vmepc-ecal-laser-01, alias is ecal-laser-room-01 and ecalod-laser-xdaq. will change to DP2-1 later if needed. Dns server : keep running on ecal-laser-room-01 but could changed with ecal-laser-room-02. to be tested with ecal pvss,ect. - DP2-1: anormal water consumption. discovered since spring already. after 2 days of data taking 21-22 June, water flow error-> no enought water ! test only chiller+heater over 3 days (28-30June): no lake of water at all ! new DP2, DP2-2 online for EE. put fibre and cable instead of DP2-1. DP2-2: 40A, 50% attenuation, A=12.59us. 4 lasers online on demand : IR, TiS blue, green, DP2-1. clean and polish attenuation box fibres. Maybe the power wil changed for 1st DP2. +/- 0.3deg. run 21764 14 Feb.
-> No effect on pulse energy -> histo OK can't explain the double peak with external trigger. -> current at 0A or 51A doesn't changed the temperature as well. -> new SHG&THG settings: no effect. slow DP2: dso21781. Temperature diode-shg-thg unstable !! -> why only with external trigger ? plan for 2nd DP2 installation: 2-8 April. - photonics: effect can be minimized by adjusting the SHG-THG temperature. -> found that the 2 peak was there in Grin, Nov2013. first online run after receiving laser from US. before reparation, run online in Jan-Feb: no double peak ! -> new laser hardware (xcal,diode) ? DP2 : measurement done on 1st laser to redo the performance%current . See calibration file. DP2: 70% internal attenuation @ 30A. Lighthecker not working: found command on twiki lmfc start/stop/status matacq_feedback restart seems ok .. Restart DP2+ green for EE but no data taking. start DP2+ green for EE, short run. IR laser not working, lamp, GPIB no control. current= 20A, attenation=10%. pulse not stable : TiS Qswitch tune several times..
IR Laser: start. new lamp. GRIN; global Run In Nov. DP2 online. current = 30A; delay A=12.68 (was 12.7ns first data) Attenuation= 70% (arbitrary). on Matacq , amplitude is 700; 820 for the green. 1st DP2 ready for GRIN. all OK. change SHOT102.c for new attenuator. clean main fibre of DP2 (switch) , Quantronix and green. internal run at 30A ok . good result. Get 1st DP2 at CERN. Bring it to PT5. First swich on Monday failed: low flow error. 2.2L/min. Spare chiller (the new one) not working. DG535 get with Photonics: never able to switch it ON. fuse brake each time. short run with quantronix laser1 + GREEN for EE only. power goes down moday afternoon after room temp. changed : 22mW@23A. after tuning the 15Oct: 80mW. Like the green shutter not working .. Connection of the Startech expansion box on ecal-laser-room-04. DP2-1 arived at Phtonics for reparation. switch OFF all . DP2 laser dismounted and on transport the 21Fev. Parts for Caltech alos shipped. training at Photonics foreseen 11-14 March. optical chain power measurement . see report here. green laser scan from weekend. bypass shutter (prog. laser from Philippe). why? no reaosn becasue shutter was ok again . safety optical switch..? green laser : OK again ; changed shielding orientation and also a screw was unscrew and the shutter touch it each time. elog. green laser: installed MU shielding around laser -> shutter OK ! green laser back to normal without any intervention ! before shutter stay closed half of the time. mystery. Laser1: it's recovered. found the problem of the flow switch error. touch the green laser shutter to debug it: it was closed half of the time ! suspect also the b field..
Laser3 offline on saturday because of out range; tuning the 21 Jan and put online the afternoon. Laser1: new logic unit, sensor flow, valve and power distribution: still water flow error ! Laser3 - IR laser online . Laser1 was anyway stopped because of too low power -> YLF crystal damage, water inside ! restart laser1 after power glitch on weekend. Laser1; new lamp. power too low. Going back during holidays to switch on back the 220V for the DP2 !!!! DP2: change feedback setting to original one: 700 ADC counts and not 400. current was oscillate 0.1A with 400 count..
clean main fibre DP2 side. calibration of DP2 (changing current). restarted PC 02 because sreen freeze... work on laser supervisor. change it with spare PC-09 later on. Laser1: reach 23.5A with feedback. changed it to 23.0A and adjust the delay A=95.42us to keep the same timing. Laser1: no more light. lamp out. replace the lamp, new cartbridge filter. small tuning: power lower than before. run at 22.5A. replace chiller with new one: to be ready for next TS, to add the heater to this chiller. Power measurement. Remove shielding . Power: -14% from 2 August, unkwon raison. Google doc : report regarding Photonics laser. Link on left hand side menu. Laser1 out: new lamp, new flow tube. --> You need to run "chmod o+rw /dev/ttyUSB0" with root privilege. removed HP-1 because seems there is error.. no SLOW data from 16 to 20 !! B field OFF 8am to 14 august morning. DP2 power measurement. beam dump at 12h. See report PDF file. Spot on IR filter close to the DP2 output. I didn�t want to touch fibre to understand clearly all actions. Also I have limited time, beam was imminent. have tested ~10sec the DP2 with a trigger (put trigger source instead of EMTC) to see our fast monitoring answer, and power level is ~15-16 ADC, while it was 13.5 as you see on my previous fast monitoring data. 15-16 ADC count is like after TS end of June, thus I don�t expect saturation on ECAL. DP2 power measurement. See report PDF file. Put back laser1 during interfill at 14h40 the 2 July. DP2 prog. crahes : when pressing exit.. no hbook files. Magnet OFF from 19June 6am to 28 June evening 5pm. - DP2: 2 news mirrors on DP2. +2 degrees laser room. - Fast shutter on laser1 and laser2, DP2 , all with USB. after new chiller only half of the DP2 power on the Matacq ! 17h10: beam dump time to investagte. See report (OM on 11 June) SHOT102 problem (internal attenuation). Clean also fibre. beam interruption --> replacement of the DP2 chiller on the morning. - check the power before replacement of the chiller. - filter on the water pipe was very dirty. clean it. Put 1L of water inside new chiller + 0.5 ml of each solutions. - set the temp . Ts= 25 degree at 11h13. At 14h25 Ta= 24.4 degrees.... ! Shutter error DP2 : when going back to Global run after minidaq elog . See Matacq plost on histo2012. No intervention ; shutter back to normal after 2hrs of global run, maybe due to new script laser1 to reopne the gpib connection automatically. - DP2 still going down: ~700 ADC bellow the green. - Put Fluke temp. recordered. Sunday 5:35 am cms electrical glitch. Laser1 stop. get call from pt5.. transfer to Jan V. restart laser1 ok ~13hr. DP2 447 goes down and down: was 1000 ADC now it's 700. Thus not due to new room temperature following friday. elog to request investigation. laser sequence stuck , 1 red sequence when we was in pt5. friday 11 Cegelec intervention on the air conditionning. only 1 controller now for the 2 units. Set point 20 degree when set to minimum temperature. nothing to do with ICS box or hardware directly. Suspect bad driver,ect. Green laser out of sequence for 1 sequence. Guy's investigation but crashed of its VNC and also ecal-laser-room-02 log out !!! restart by Emanuele underground but lot of issue or problem to restart DP2, ect. remember lasers setting : internal attenuation = 40% for DP2 and Laser1. Laser2 online by Emanuele during the night. laser1 OFF 'water temp omega' ?.. --> replace the right hand side chip relay solve the problem. remove piece of glass OK without dismount the flow tube. same power as last time 13 April thus should be have no difference on monitoring. Power measurement done during technical stop. See slide OM meeting here. See automatic problem with Emanuele while rebooting PC. Confirmed by Kejun. Change current DP2 from 45 to 55A (to get 800ADC, was 450 before) Delay adjusted . DG535 spare for the green laser. before using timing delay through EMTC. After 1st data taking in global run: lasers several issues for lasers from Easter. - laser1 unstable: failed to put laser2 online the sunday..keep it all the week at 25A because of Photonics priority and Marc decision. and--> Replace the ICS box with the laser3 one. OK then ! Laser1 service Friday 13: new lamp, remove flow tube because of soldering needed. All ok after at 20A ! Liyuan& Kejun for laser installation. ecal-laser-room-01: unchange. Need to start always Dns server on this machine. ecal-laser-room-08: /home/laser/dp2-447# ./avs for the spectrometer if needed. New DP2-447 laser : configuration file is the same, laser_h.cfg but H4DAQ need to be disable, useless. communication is done throught internet by calling this PC from ecal-laser-room-02. Iset is the working current, 45A now. Increasing or decreasing the current to turn ON laser or to turn it OFF is done by automatical step --> 1A/ sec. Delay A: main delay to be adjusted if needed to get good timing. Others delay should not be touched. ecal-laser-room-04: green laser DLT-419QT from Saclay. No visible interface. Manual here. 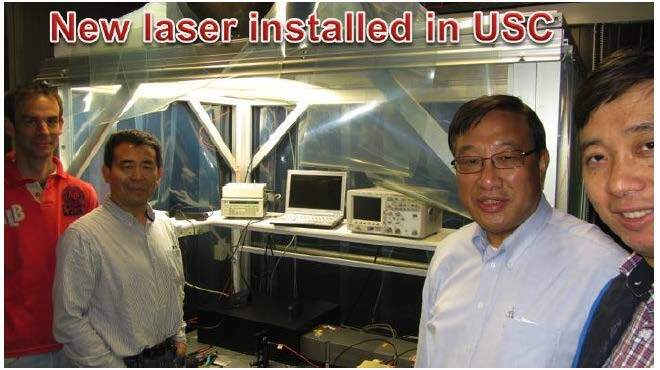 Laser2: new TiS LBO by Liyuan . no effect. tuning to get FWHM smaller. Laser1: water leak on YLF LBO. replace the LBO . tune laser1 YLF and TiS myself. first test online : channel 5 optical switch, program instead of laser3 . plot here. Laser1 online as main laser. finishing electricity job.. Laser1 : not put back on: no air conditioning, wait installation of controller.. 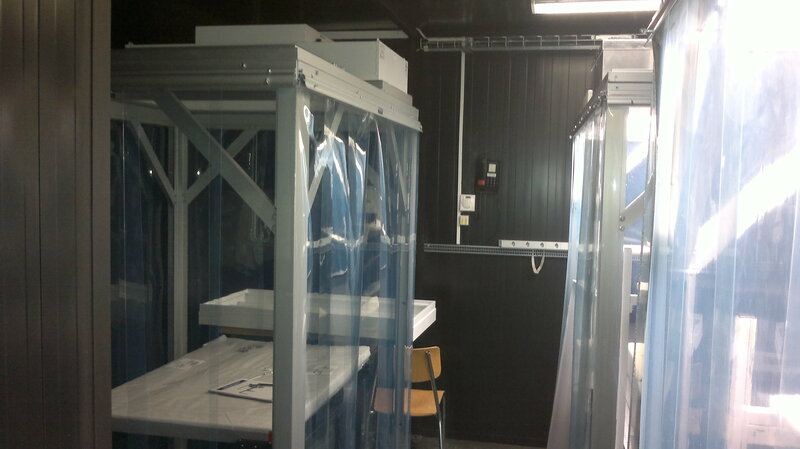 Received SIMPLEX cleanroom. Next day the optical table. CMS week. New lasers presentation. Was missing fire detection schedule. and not informed that power cut will affect also the others laser rooms !! power back Friday 17. Switch on laser 1 friday afternoon for the weekend. see elog. CV intervention done: air conditionning, cable control..
laser1-2 OFF , magnet test,ect. Laser1: calibration ok. 21A, 40% attenuation. Noise on laser23 histrogram display, strange. Laser1: flow tube broken. new lamp, new gold reflector. ETM=- 5570hrs.. ?? PC: kernel version problem, can't start ./laser23 ! kernel should be xxx89 cernsmp and not 103. Wrong Kernel by default now after booting !!! Laser1: change internal attenuation from 20 to 40% (increase power) requested by Federico. Just for 1 day..
B= 3.8T ~20h evening. laser1 and 2 ON. laser2= 24A, laser1= 23A. Laser2 as red laser, second laser. 24A. New lamp. Lasers OFF the 3 Nov : no cooling. Lasers ON 4 Nov for the weekend. + New HV pulser ! at the same time found TiS blue trouble, pulse not stable, ect.. : no more HV (cross IR..). Ship for reparation..
Laser1 back to normal, stable RMS intensity (tuning of HV pulser, decreased a bit power) current 21A is OK ! Magnet discharge 7.40am. lamps not OFF thus not a fast discharge ? laser2: for the night change internal attenuator from 30 to 99%, and remote one from 10 to 3%. test for Matacq linearity.. Previously, day before, a scan has been performed changing only the remote attenuator . laser2 small TiS tuning because RMS amplitude drift. laser1: decrease current: 23.7 to 23.4A and adjust delay. laser2: go to 26A ~ 1 day, then 27A. go back to 24.5A. - changed the switch 1x5 mapping: channel.map2. when laser3 is called, channel 2 is selected . No hardware modification like this. Blue laser1 disappeared Sunday night> No investigation from on call shifters. Monday morning: just put internal trigger , tiS box in manual , nothing was wrong. mystery. no error on log file. - TiS shutter3 GPIB error, from 19h28 25 August up to 11h 26 August, time when ECAL call me . - stop at 16.24 the Neslab to see difference because yesterday no difference with Nesalb on the matacq. neslab: found at 37 degrees following blue power degradation. As friday 22 July. laser3: RMS amplitude above orange line..change current from 20 to 21 A.
holidays.. problem with laser1: drift amplitude and then saturday switch stop : problem TiS box shutter. Laser2: no blue light. mis-aligment always..from start up. No spare laser bight or weekend. laser2 no more blue. need tune the LBO. saturday fast dump. Monday evening: laser data, no B field. laser1: 23A. A=8.09us, B=3.2us. 60% attenuation not yet maintenance. received 2 YLF LBO, 1 valve, 1 gold reflector from Europe. Laser1: just check main fiber coupling and then power OK on Matacq. problem: was the logic unit. the 2 power supply are OK !!! --> spare logic unit 234 : very low power for YLF2 while the threshold is ok.
wait for the 224 logic unit. - laser3: tuning. board 234 investigation if time. - prepulse ; jump effect: try test to modify pulse raising time. - all laser: check pulse on matacq. see water leak. One screw on YLF Crystal not well fixed..
TiS red: can't get pulse stable. instability. FWHM too big also, 45-50 ns now ! Run at 21 A !! YlF too low maybe ? the new power supply laser2 failed again when tuning TiS ! Electric arc on main contactor inside the board. measured phase and try to investigate with Sylverio. 235 V between 2 phases. According to Quantronix should be 190-215V. BUT most probably: B field. the girder is just on the roof, the air-unit failed on this room also in the past..
Laser1 ONLINE : rms amplitude OK , problem disappeared. On Matacq: low power, ADC count only 200-300 even for the RED while I didn't touched it (only new logic unit). need to go back to original remote attenuation which was 10% and not 15. Laser1: not yet online because internal trigger all OK. external not --> double peak timing. New DG535 didn't help. not the problem. Laser1: new HV pulser and change pockel cell also. See calibration. run ongoing. Laser3: current jump from 20.5 to 22.8 by mistake. few hours. but ECAL saturate with RED , with this new logic unit.. need to change remote attenuator. Cooling valve OK while it is logic unit from Laser3 which make valve trouble. Laser3: valve OK thus not yet conclusion..
Laser1: change the lamp, tuning. small TiS tuning. seems OK.
- the one on LASER2 : RS232 out of order, this is sure (not working on laser3 also). to be shipped to Quant. RED laser power quite different on Matacq: put 20.5 A on board. control box with Key not working..
discussion OM meeting to see how to define laser HW intervention. Laser2: see that the green filtre bandwidth is bad --> green light after the filter unlike laser1. replace with new one. check power: no filter 32.7 mW, previous filter installed up to now: 30.7mW, new filter: 31mW. RED laser3: Valve ok from last 4 days.. even if there is some noise during operation. LASER1 online, small tuning. to work on laser2. attenuation: 35%. No more RMS jump. LASER3: low YLF. need service. see on DSO before data taking. after switch on/off laser, leave the valve cooled, all is back to normal. Laser1 too high power: move attenuation from 50 to 35%. Laser1: TiS tuning . try new poco cell. no difference on DSO. get tuning to have pulse stable. need to see over time how it goes. On slow monitoring: can see noise on the TiS pulse. Laser2 done. power not so high, closed to the ADC limit on lightchecker but pulse very stable on DSO. FWHM ~28-30 ns but need to work on laser1. Laser2 : tune YLF from scratch because pulse shape not so good. Found a piece of glass inside YLF chamber thus dismount everything (take out the crystal). change lamp again (was new but already visible damage !) Check and tune IR from scratch. Power lower than in March but pulse OK. (1600mW@23A now, was 1800 March). TiS2: remove Q-switch to re-align correctly (pulse not stable). all OK at the end but FWHM=29ns. Need to improve again. Laser2 investigation: can't turn power ON with key. --> solution is to replace the full power supply 10K. Laser1 online by shifter because Laser2 failed. Laser1 show again power RMS unstability. need to replace q-switch or HV pulser. Laser3: need delay adjustment. internal attenuation from 17 to 14 %. Tune laser1 while laser2 online for a while. YLF laser1 was mis-aligned after that power increase , OK and TiS very stable (2ns jitter) so put it online to see how it goes. Laser2 out of order. error. can't restart: change the lamp then OK ~ 15 min and suddenly lamp and flow tube brake. Huge water leak. Laser1 online. rms amplitude not stable. Laser2 ONLINE because Laser1 RMS instability. tuning didn't help (pulse ok on scope..) 22.5A, 30% attenuation. Laser3: was OFF. turn on back. small tuning. Laser2 OFF --> water leak--> pipe connector unscrew on YLF chamber. Try after: no more green light. Need tuning from scratch. B=0T. Laser3: small tuning, check coupling main fiber. Laser2 Online during Technical stop , still ongoing: 22.5 A, 50% attenuation. B=0T. Technical stop B=0T. Quick tuning laser 1-3. laser3 new cartridge. lasers still very stable. Now internal intensity reduced again from 30 to 25 %. On MATACQ : power ~ 350 ADC for blue is now reference. Request from P.Gras to decrease blue intensity by 20% because of saturation : internal attenuation Laser1 from 40% to 30%. Light checker power was ~550-600ADC, now 450 ADC counts. Laser1 power was like this since 4 March so saturation since a while now. - Laser1 online is OK . no more waves - unstability on the amplitude RMS. see matacq plot. - Test coupling for APD/PN ration with laser1 main output fibre. 5 x posistion. - Laser2: low water level : leak, water on the YLF laser while the lamp is ok, nothing strange. remove and install back the same lamp.. check the screw. - Laser3: "current error".. --> lamp broken one more time , in the middle as the 4 Feb.
reason unknown but all was new (housing, ect..) . maybe the crystal is moving (unglue) ? ..
Laser3 tuning, quick YLF and RED. - Laser1: Change the lamp; YLF tuning; change the cartridge filter and the temperature sensor because of Di Water and Water flow error all the time. - Laser1 --> Laser2 ONLINE because of instability on the energy RMS (other OK). Laser1-3 online data taking with B field 3.8T. - Laser3: new YLF chamber because need to dismont everything : flow tube broken inside. found the crystal metallic end face is unglue or closed to be.. see calibration. 9Fev: check again YLF IR: IR power increase but not the green. - calibration done. Good health check with laser. - Tune and test laser3. - End of cleaning all optical connector : switch and main laser fibre. Channels involved are here. End of 2010 operation. stop everything IP5. Monday change back laser1 to laser2 because laser1 not so good. Laser3 : no more data on Matacq while there is still good pulse on Slow Monitoring. Quick services (because run with ions..): very low power on RED main output (below 50%), YLF quite low but Ok for the lamp 1000hrs. Change the lamp then found TiS Q-Switch mis-aligned. Strange. Power recovered, OK. See plot. Laser3: 20A, attenuation go back to 7% --> ~500ADC on Matacq, OK! - Laser2: new lamp, usual maintenance. Laser2 internal attenuation 40% to 60% to be far from lower limit. spare part updated : received 6 Phase modulator for the power supply. - technical stop ; No B field. then B field the weekend, stop again ; ramp up Tue.27. - Run Laser2 internal trigger 1hr 22.5A: ALL OK. power slow monitoring as before. - Laser3: power decrease (ylf) . Change the lamp (500hrs..). - Stop laser1. Time to change the lamp 1000hrs See matacq PLOT. - Problem restarting laser2 and also laser1 after new lamp: 3 phases monitor died, the 2 lasers at the same time !! - Problem with VME interface laser supervisor. Clean fiber of PCI board. - today switch from ./laser22 to ./laser23 removing the intermediate position 0 of the 5x1 switch. Now optimized when moving from blue to red. - Laser1: current were 23.8A- change to 23A and re-adjust delay A. Laser still stable, ok.
- switching time reduce from 8 to 4 sec ok: sequence is now 38 min instead of 48 min. since RUN 146325, e-log ID 449159. TC, technical stop. Magnet ramp down. Maintenance/checking of laser1-2-3. laser1: instability last hours. - laser3 back to calibration sequence. 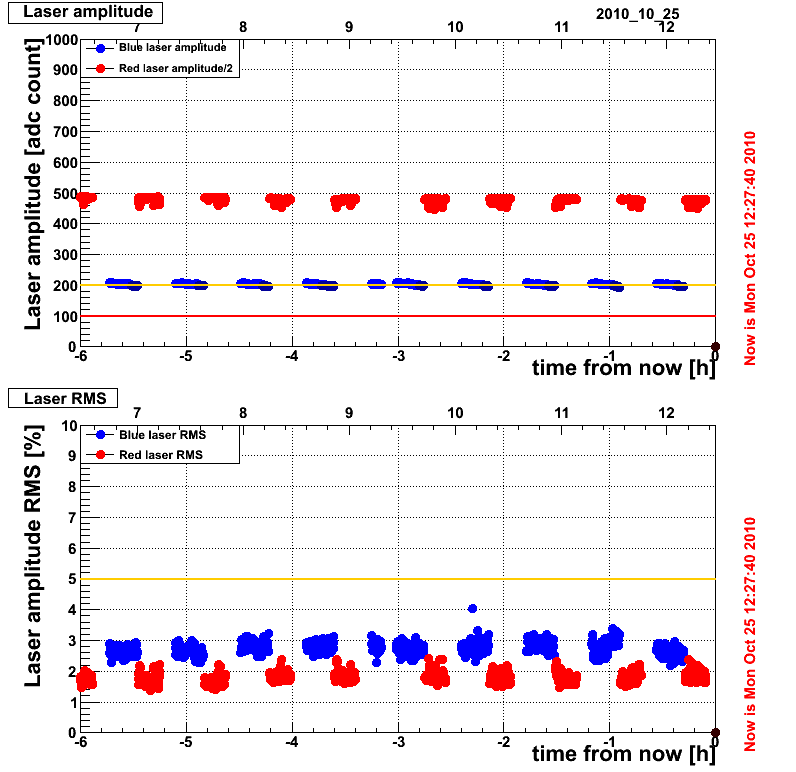 Issue with RED laser: long switching time from blue to red or EB to EE so lose 1-2 LM region. Also after some times no respond from Laser22, no more blue and RED. Restart remotely laser22 OK but freeze after 1-2 hrs... Found underground ICS box laser3 no more display and DG535-2 (spare) wrong trigger rate. RED laser was lost after B field stop and start so could be the power supply of the ICS box as already suspected. - RED laser: change the lamp because impossible to restart laser after B field interlock (mid August). Laser back to normal despite lamp not broken. - laser1: no problem during the last 3 weeks. Refresh training in the laser barrack , with Chris Jan and Vladlen. Turn on laser2 to check laser. No B field from Monday 19 to 26 July. CMS techincal stop so change lamp of laser 1 and laser 3 before holidays. No tuning of TiS. Full tuning of YLF and TiS. LASER2 out of order after weekend (current = 7A, not in used) --> flow tube broken, lamp ok, no leak upfully. Laser2 and 3 ok after night run internal trigger. Wait B field ramping again after CMS-LHC stop. and OK. so valve is not working , dust. Clean water tank , replaced distilled water. Run the night 1-2 june laser 2 and laser 3 internal trigger. Plot on histogram. Lasers OK.
- laser 3 : lamp broken; and strange behavior of secondary cooling water: try new temp sensor, new Parker valve: no effect. Flow meter shows always open circuit, like valve open on laser cooler. But valve on/off seems OK (noise) and was of few minutes at laser on. Switch to Laser2, online : 22.5 A, A= 8,39us, B=2,9us. Laser1: fwhm goes from 23 to 28 ns, jitter ~8ns. - Matacq Laser1 : Average RMS amplitude and jitter OK but spread. Slow monitor: 2 peaks. - New ./laser22 code : add information on the shutter , to get real status of the switch position and not theorical one. - Laser2: problem of last weekend was the lamp --> broken , on side brake when I pick up from YLF chamber, water inside. Lamp: new model from Quantronix, only 439 hrs !!!! - Laser1: new HV pulser. Was faulty (check with polarizer), New calibration reference. Working curent = 22.5 A. - Laser1 online at 17h20 : working current 22.5 A, delay A = 8.39ns, delay B = 2.90ns. - From Friday evening: scan with remote attenuation, P.Gras, all the weekend. - Laser2 : YLF change a lot ! why ? no reason. Was very stable before, I touch anything. Trigger ?bad control from Philippe on GUI ? trigger? - Laser1 calibration done with new crystal. - Laser3: check tuning. all ok.
- Laser3 back Online; was removed since 25 March following calibration problem and air-unit installation. - Laser 2 still online, feedback : power at 22.5 A now. Laser1 was still unstable so last thing to be checked was the crystal. - Spare conditionning unit installed; RED laser out of the run for that and to understand problem: switch moving while no trigger ! - no more GPIB error. - GPIB error but for TiS laser3. Try spare TiS box but communication failed; same on laser1 --> was the repaired tis box received in Dec 09 ! - Go back to 2 PCI board and new software, go back with AC smart unit control. - GPIB crashed again so problem is not 2 PCI board. - feedback laser3: very BAD result for jitter--> wrong setting for laser3 (was blue setting instead of red) see Matacq plots. - Problem GPIB every night; since 8 Feb if there is long global run... change ICS box, cable...didn't help. - Put feedback ON for laser2 and laser3. - Laser3 fine now after YLF tuning --> no more huge RMS. Matacq OK, as laser2. - GPIB crashed again 2am but error on TiS 3 , was on TiS 2 before swapped the ICS box so seems the ICS is faulty. Tune YLF laser3 (rotate Qswitch), calibration online. Crashed last week and week before during the night (Kyoungha) Suspected NEW DSO. Change PC ecal-laser-room-02 with new one. Laser3: faulty RF driver, replace with new one. BUT after tuning screw on RF is back to normal so re-installed original one. - Laser2 online local run (CMS open) 23A (should be 22.5) internal 25%, A= 8.41 us, B=2.9 us, timing = 11750ns. One shutter OUT (main TiS shutter). replace with new one. - Received spare parts and new IR detector. Need to tune it from scratch --> wait next year no B field to work with IR viewer. Maybe come from air unit on control room which was stop (but since friday) was 24.5 degrees. 4 Dec : Laser1 power too high: internal attenuation reduced from 50 to 18 % ! on Fast monitoring is ~4-5 ADC (was 7-8 for laser2) --> MATACQ is 300 ADC as laser2. Laser1: new YLF chamber (was still the original one, 1999), new flow tube, new lamp. 10-20 Nov : Liyuan, Kejun: new software, 2 GPIB card,ect. No tuning at all on lasers. 2 Nov : LASER1 lamp brake Sunday (B field stable at 3.8T) time = 1770hrs. 28 Oct: LASER1 jump --> YLF jump, due to B field ? run DSO21280-1.ps stop 28Oct at 14h30. Should be no trigger - no ECAL during B field increase ??? look timing of laser plots..
25 Oct: Laser1: check and put back 23A because claim power is too low. A=7.42ns; power = 0.33mJ. 13 Oct: No laser all the week --> cms off, water leak. Clean/polish main fibres lasers / optical switch 1x3. (3 lasers) all were not perfected and need small polishing. 12 Oct: Laser1: put blue filter, FD1B as for laser2. Move main SHUTTER because even if it's closed pulse was not in the middle and there was some diffuse light after ! 2 Oct: Laser3: internal attenuation at 20%@800nm to have ~30mW as laser1. 1 Oct: Laser1: internal attenuation at 50%. Remote attenuation has been changed on DQM. 7-17 Sept: no cooling, no pc: pt5 maintenance. 30 August: LASER1 lamp went OFF as foressen with B filed interlock (slow dump) - sunday evening. 21 August: Laser3: new lamp, calibration, tune YLF and 800nm to be ready for ecal. 20 August: Laser2 calibration: change all YLF chamber components. Working point: 22A, FWHM=23.5ns. Power: 30% more than last run online at 23A. A=2.9 us. 18 August: LASER1 online. Because Laser2 lamp broken - same time as magnet ramp down (~7am). Flow tube broken also. Feedback ON why ?... 3) Pb with DG535-2: need to be reboot and error communication 4) Lamp OFF due to bad info on magnet interlock. 16 July: TiS box LASER3 repaired --> soldering of green LED. will changed the trigger for Fast monitoring --> trigger selection fine with internal mode but not External !! - Laser2 OK on ECAL: ~2000 ADC for EE (0dB and 50%) and ~6000-7000 ADC for EB. 15 July: Check LASER2 power --> lower than 7July on EE according to S. Ledoskoy. - TiS2 power on laser: 44mW. On Ch99: ~3 mW so 11dB. Just before intervention was 0 mW !! 14 July: LASER3 ready to be ONLINE. Online with new digital scope. Should not crashed anymore ! Keep LASER2 for ECAL , with green filter. 9 July: - Magnet field ON, start. 3 Lasers internal mode. -> LASER3 to be ready next week. 6-9 July: Tune Laser1 and Laser2, Delay A. Laser1: remove p.cells to check power. Continue polish fibres on laser : done for slow monitoring, laser 1 and laser2 with new polisher. 24-25 June: Tune Laser1 (YLF also). Got new polisher. 17 June: LASER1 online with green filtre from 4pm. But put shielding box on YLF before --> YLF not stable, jitter=7 ns. Check tuning LASER1 --> it was bad because lasing without trigger ! --> explain high power ! 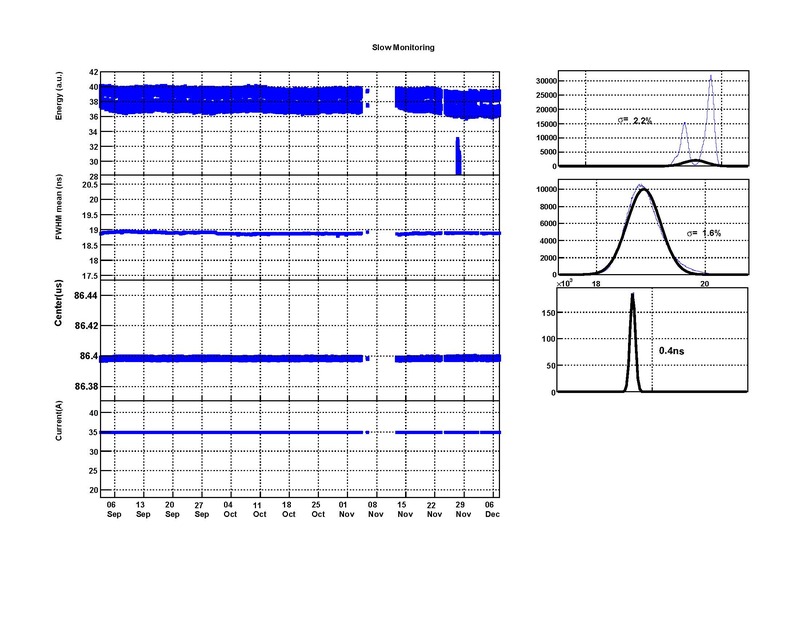 Tune TiS to have no lasing up to 23.7A so OK --> more stable (dso20910-1.ps), jitter=4.5ns @22A. 4 June: LASER1 : power went down mid night. Same time as current 22.1 --> 22.2 A. YLF increase but power TiS decrease ! Files is DSO20890-1.ps. --> temperature of the room ?... Tune again Qswitch laser1 . Power is back. 2 June: LASER1 online for Cruzet but begining of run -> wrong settings. all delay = 0 ns, TiS attenuation=40%. 27 Mai: LASER3 TiS box: 1 pin RS232 not connected properly inside: wrong jumper in used. Adi: monitoring study : found signal very low after laser trigger, after ~4us after TiS pulse ! 26 Mai: LASER3: tune. 115mW@20A. TiS box not answering to GPIB. To be investigated. Used a spare one. 25 Mai: Put LASER 1 online --> P. Jarry, to see difference fwhm,ect. 19 Mai: Amplitude EB: ~4000 - 5000 ADC count , on fastcheck. Before was ~2000 ADC, and last days go down to 1200 ADC once. --> Saturated from P.Jarry (gain is switching to 12, bad) so need to decrease power by 30%. Can't wait configuration file to be changed so changed internal attenuation TiS from 99 to 70%. P. Jarry: nominal count should be 2500 ADC count. 2) Removing 1x5 optical switch --> clean and polish all fibres. Not yet perfect but better. 15 Mai: Laser2 attenuation: get 6.8dB attenuation on first device, optical switch 1x5. Need to clean and continue next week. Power TiS output= 50mW, power after coupling 1m fibre=38mW, power after 1x5 switch= 8mW. 14 Mai: 13-14 Mai: MWGR. - LASER2: check attenuation, coupling of main fibre. Need to check full chain to recover power. - DSO: put back old DSO online. Put Digital on with ecal-laser-room-01 for Kejun. --> else all the time GPIB error during MWGR. 5-6 Mai: ./laser22 crashed. log_5Mai.log --> HP2 head error then GPIB error --> no more control the 6 Mai 14h26. 29 Avril: . LASER 1 : lamp broken after few hours only. Same as for laser2 6 March !!! --> run during global RUN: Laser3 selected and switch scanning but laser not needed !
. LASER2: move mirror between YLF/TIS to allow space for box for shielding --> tune TIS from scratch. 21 Avril: Test new cooling OK. Leak detection OK. First long run with LASER2. inside very noisy --> replace with laser3 one. Maybe lamp brake due to this problem. setting: delay A= 7.55us and current 22A OK.
- From 21Nov: switch OFF laser up to cooling is back ! - 14 Nov: ramp up to 4T. measure current on cathode laser2, shield inside laser room.
. ramp up didn't break the lamp. - 6 Nov: magnet go down fast the night 5-6 Nov --> lamp LASER2 brake !!! as laser 1 the 24 Oct !!! Field effect ??? --> on elog: Magnet fast dump the night 1h50 6Nov. LASER1 online because LASER2 lamp broken. - Monday 3 Nov: restart laser2 because GUI was OFF ! - 24 Oct: LASER1: broken from 21 Oct ; flow tube damaged. Green T = 7.2A but wait no field to be able to have power meter. - 22Oct: today no field so tune laser2 OK. Put LASER2 online because LASER1 failed the 21Oct --> lamp broken. Liyuan try to put laser2 online but failed. Field effect ??? --> on elog: Magnet fast dump the 21Oct. - 20Oct: discoverd with Liyuan than we can not used power meter and IR viewer under magnetic field --> can't tune laser properly !!!! - 17 Oct: no laser events from 6am. Go the morning --> no more air conditionning Out of order. - 2 Oct: LASER2 stop --> cooling ion USC. At the start up, flow tube brake --> huge leak. - cooling circuit done. Waiting for electrical power. - LASER1 : tune to be ready as spare. Center = 11750ns as ref. (like laser2) Plot internal run online. changed the 2 relay inside logic Unit (valve no more working) after cooling break at USC55 the week. Laser2 leak again --> leak on YLF chamber itself. Changed with new one. tune YLF and TiS. Laser2: leak on YLF --> flow tube un-glue. New flow tube, new lamp. No time to run internal mode. Quick tuning. 1) Still problem with cooling. Main interruption of mixed water. When changing filter on laser2, laser1 body filter failed. 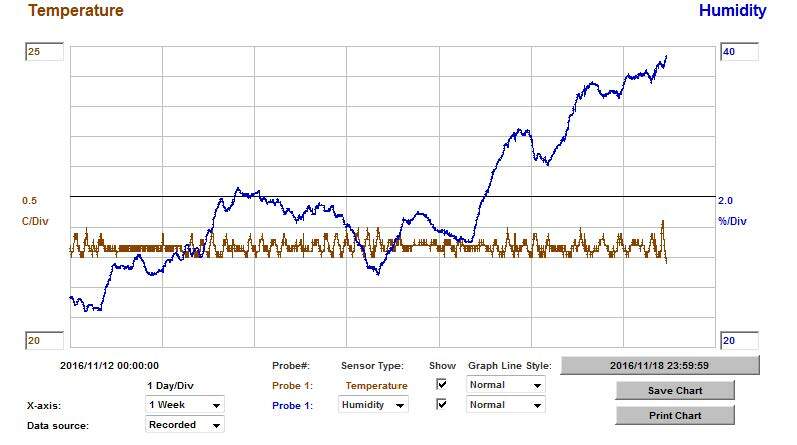 cooling pressure increase after restart ! 2) Seems to be possible to used chilled water so used circuit from H4. - Laser1: change HV pulser. Problem solved. Laser1 back to normal. Shipped HV pulser for reparation. - Same as for Laser3, I got same trouble. - One scope failed in H4 during laser1 tuning. 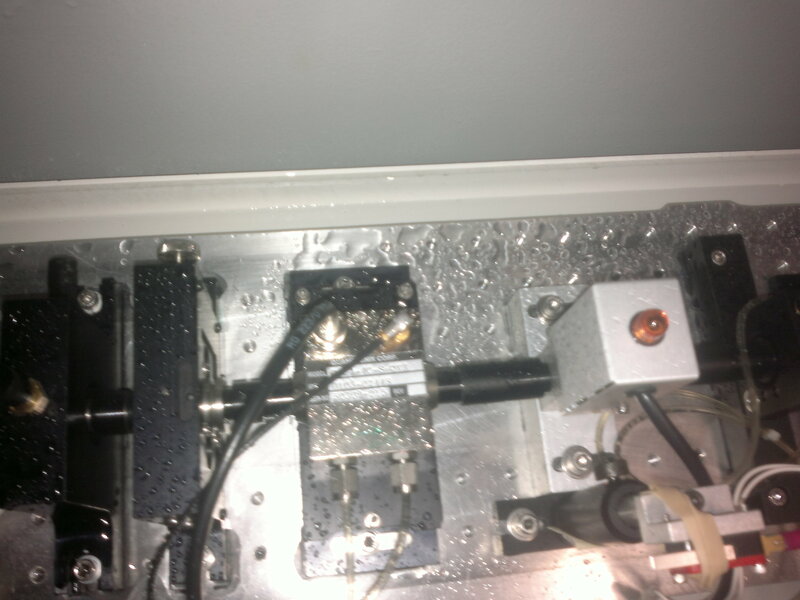 Laser2: leak of YLF LBO: broken water connector (shipped to US) Tune all laser during all the week. Need laser for EMTC, comissionning with few SM. Test the timing of switching sequence. Laser1: restart for Dee4 after cooling breakdown. OK to run 3-4 days without HV and delay, pulse still OK.
2) Water flow error time to time. Change sensor inside water tank, same problem. but during weekend OK.
Pt5: Water more and more dirty --> degradation of water quality visible after 4-5 days of commissioning interruption. Laser1: new lamp (2100 hrs). Quick calibration. Run at 23A: dso20096dat, FWHM=20ns. ONLINE: start at 22A for Dee4. complained that laser not working (during vacations) but found external trigger at 300KHz. YLF was lasing but very bright green light and NO blue !!! LASER1: new lamp. Max YLF=23.7A. After, no more pulse stable. Re-installed Q-switch on Laser3: Q-switch makes same error as Laser1 "RF driver mismatch"
Received new RF driver, new power supply. Laser1 online: stop run (dso20034) and feedback because increase to fast. stop at 23.4A and go back to 22.8A. LASER1: ERROR display (LOW RF) 391 RF driver fault. Try with Laser3 Q-switch: same error. Liyuan and Kejun at CERN . Move lasers 1 and 3 at USC55. - low power. find flow tube broken. Replace it but find crystal moving on one side. crystal not glue anymore on one side. Deside to move laser2 at USC55 and put Laser1 online for Cosmic. No WATER from 21Dec to 16Jan. - New LBO assembly because of damage pipe connector (corrosion). Use spare one. - YLF quite OK. Tune TiS. Start Laser2 and 3 for SM recovery. Laser3: replace broken flow tube. Life time: change after 1year and 3 month. Main POWER CUT at CERN. Restart Sunday and Monday (Checking&tuning laser2). - Still Laser2 and 3 online. - Laser3: change HV pulser with the repaired one (the original one,from 15January). Can reach FWHM 21 ns but some double peak at 26ns. Tune at 27ns to be stable. - Laser3: tuning because of too much current increase, feedback. - Laser3: YLF LBO water leak. This may cause from ~3-4weeks the pulse drift. Lost pulse on XDAQ --> no red event. - check discriminator: ok (-800mV) up to 45% and 1% TiS attenuation. - new attenuation box : one more remote control filter. - new software: separate processing for hardware and data acquisition. 3 lasers online ok.
- spectral filters to check pre-pulses on SM. - YLF3 interruption: LBO water leak (water tank level warning). - change lamp laser2 (mistake because old one : ~350hrs only). - Laser3: new lamp, new socket because of corrosion. See picture. - Check that energy is different on fast monitoring. - Laser2: calibration done. Run internal mode. Working at 22A OK --> FWHM=25ns. Buy and install a new one in stell. - new plots. summary from January. - Neslab : water consumption too high: cover need to be keep in place, solve. Create instability twice: begining of March and 10 March. - new software, ./laser2test : H4 DAQ communication disable during data analysis. - Laser 1 and 3 : new lamp , calibration. --> stop lasers monday morning. ready for next SM: SM16 in H4. - received repaired HV pulser (laser3): spare part now. - received new power detector, new scope. - send DSO to Liyuan. - Chilled water shutdown--> stop lasers. - temperature laser2 room not stable from one week. - Laser3 re-tuned: only HV unit energy goes from 20 to 80mW ! - tunning laser2-3. laser3: HV tunning recovered energy from 56 to 80mw ! - Laser2 tuning; current 23.5A for SM5. - calibration laser1 New lamp - new logic unit. - received new logic unit with J105 cable. Works fine on Laser1. - safety investigation (level2 TTL): level2 TTL not working properly. Take signal from the first cable of the MEM. 1 BNC broken, 1 device coincidence unit broken, level2 TTL from MEM always signal --> use pin diode directly. - communication back after power off all - check signal on RS232 and disconnect control unit. - Laser2: control unit broken --> no more YLF control. Change control unit with Laser1 to have Laser2 online. - Laser3: some dust of gold in the water tank. --> 800nm: NRG=38.5mW@20A After tuning (HV p.cell) 79mW: OK.
To keep same energy level: TiS attenuation 40% to 20%. HV not stable with time ? to be checked. --> laser1: small tuning; all OK.
- Liyuan at CERN: investigate Laser2 YLF / feedback software on Laser2. Laser monitoring workshop. PDF on reports page. - Laser1 stopped because of chilled water maintenance. Change lamp. Make calibration. - Laser2: change mirror HT/HR and LBO: no improvment, even worse. - Laser 3: replace YLF chamber because of leakage. - Laser2 maintenance: change lamp because power 40% lower (1000hrs) but with new lamp still too low. YLF: 1400mW instead of 1800mW @23A. 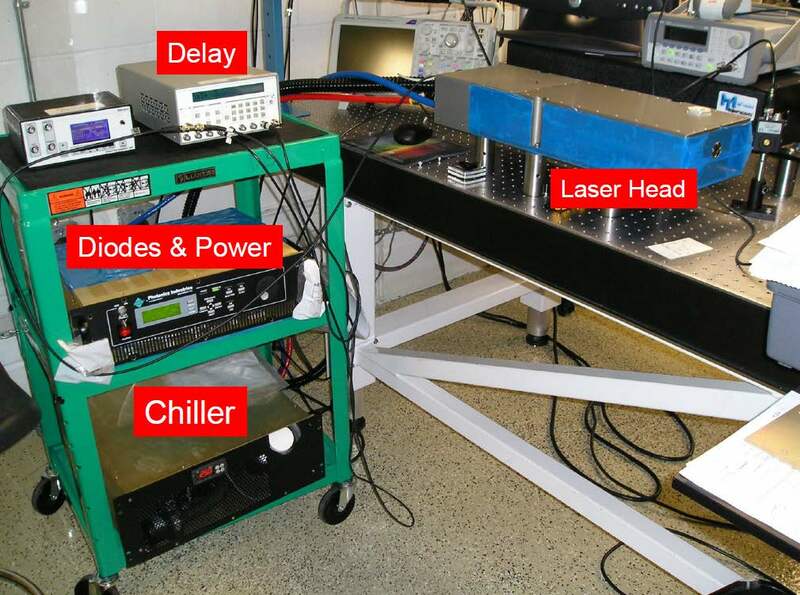 --> Laser1 online for Cosmic rays. Laser3: not yet used because of flow tube broken. - Lasers ready to be used for cosmic rays. - Laser1: stabilization of the YLF. Run of 20hrs fine. - replaced all YLF lamp + calibration. Laser1: replacing YLF chamber assembly because of flow tube broken. diCon optical switch 1x80 is going to be shipped to repair --> no more control of the display. - TiS box3 repair: red LED replaced. - Laser1&2 runs. Small tunning of LBO. - Laser3 TiS box3 not working on Computer Mode but everything still fine on Manual Mode. Cable OK because TiSbox2 works fine on Laser3. Computer mode it's ok time to time few minutes. Contact Sriram from Quantronix for help. - Run the FFUnits on the 3 laser rooms. 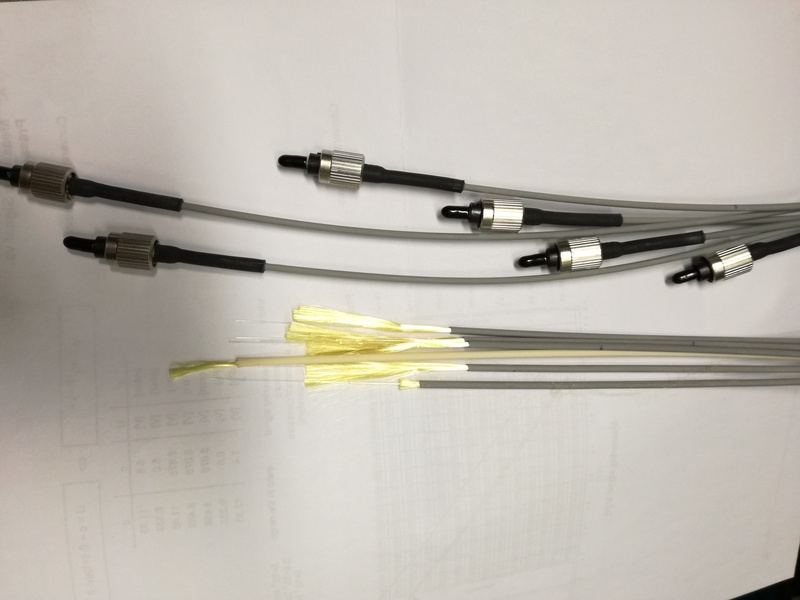 - Reconnection of fibres in each laser (remove for cleanroom installation) with cleanning. - Spare rack: replace CAMAC crate with a new one. Add a NIM crate. Saclay crate free. - Runs 3 lasers 1 day before installation of softwalls. Received softwalls at Meyrin site. Internal transport automatic for Prevessin (no EDH). One crate's damaged. Discovered that CAMAC crate used for Laser1 not working anymore (24 and 12 V). 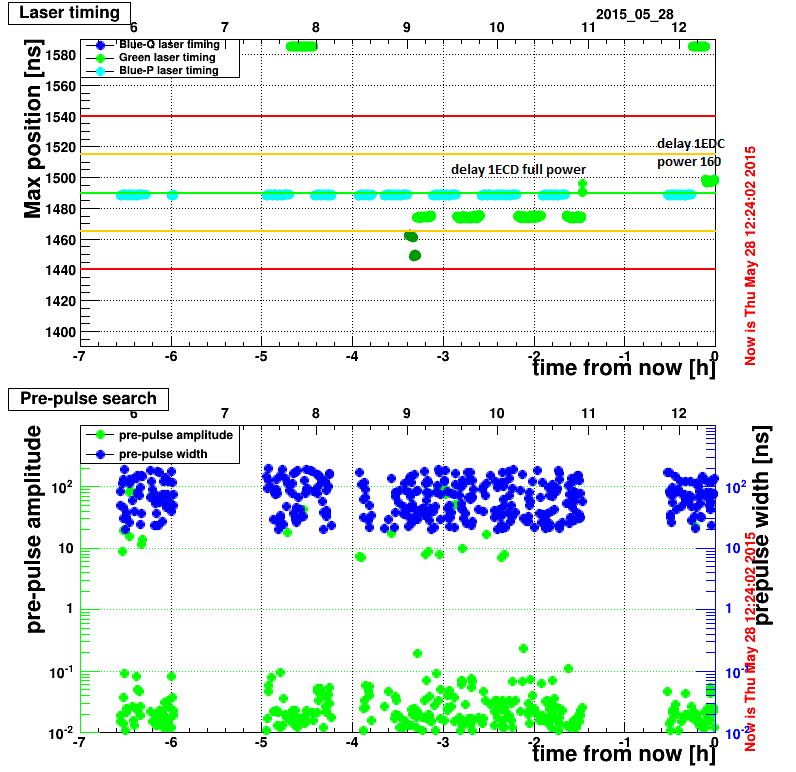 Thus previous plots for Laser1 not reliable.